Born at Nisibis, then under Roman rule, early in the fourth century; died June, 373. The name of his father is unknown, but he was a pagan and a priest of the goddess Abnil or Abizal. His mother was a native of Amid. Ephraem was instructed in the Christian mysteries by St. James, the famous Bishop of Nisibis, and was baptized at the age of eighteen (or twenty-eight). Thenceforth he became more intimate with the holy bishop, who availed himself of the services of Ephraem to renew the moral life of the citizens of Nisibis, especially during the sieges of 338, 346, and 350. One of his biographers relates that on a certain occasion he cursed from the city walls the Persian hosts, whereupon a cloud of flies and mosquitoes settled on the army of Sapor II and compelled it to withdraw. The adventurous campaign of Julian the Apostate, which for a time menaced Persia, ended, as is well known, in disaster, and his successor, Jovianus, was only too happy to rescue from annihilation some remnant of the great army which his predecessor had led across the Euphrates. To accomplish even so much the emperor had to sign a disadvantageous treaty, by the terms of which Rome lost the Eastern provinces conquered at the end of the third century; among the cities retroceded to Persia was Nisibis (363). To escape the cruel persecution that was then raging in Persia, most of the Christian population abandoned Nisibis en masse. Ephraem went with his people, and settled first at Beit-Garbaya, then at Amid, finally at Edessa, the capital of Osrhoene, where he spent the remaining ten years of his life, a hermit remarkable for his severe asceticism. Nevertheless he took an interest in all matters that closely concerned the population of Edessa. Several ancient writers say that he was a deacon; as such he could well have been authorized to preach in public. At this time some ten heretical sects were active in Edessa; Ephraem contended vigorously with all of them, notably with the disciples of the illustrious philosopher Bardesanes. To this period belongs nearly all his literary work; apart from some poems composed at Nisibis, the rest of his writings-sermons, hymns, exegetical treatises-date from his sojourn at Edessa. It is not improbable that he is one of the chief founders of the theological "School of the Persians", so called because its first students and original masters were Persian Christian refugees of 363. At his death St. Ephraem was borne without pomp to the cemetery "of the foreigners". The Armenian monks of the monastery of St. Sergius at Edessa claim to possess his body. The aforesaid facts represent all that is historically certain concerning the career of Ephraem. All details added later by Syrian biographers are at best of doubtful value. To this class belong not only the legendary and occasionally puerile traits so dear to Oriental writers, but also others seemingly reliable, e.g. an alleged journey to Egypt with a sojourn of eight years, during which he is said to have confuted publicly certain spokesmen of the Arian heretics. 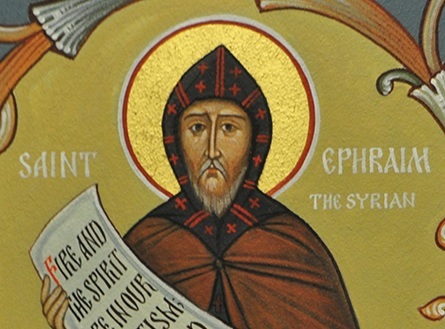 The relations of St. Ephraem and St. Basil are narrated by very reliable authors, e.g. St. Gregory of Nyssa (the Pseudo?) and Sozomen, according to whom the hermit of Edessa, attracted by the great reputation of St. Basil, resolved to visit him at Caesarea. He was warmly received and was ordained deacon by St. Basil; four years later he refused both the priesthood and the episcopate that St. Basil offered him through delegates sent for that purpose to Edessa. Though Ephraem seems to have been quite ignorant of Greek, this meeting with St. Basil is not improbable; some good critics, however, hold the evidence insufficient, and therefore reject it, or at least withhold their adhesion. The life of St. Ephraem, therefore, offers not a few obscure problems; only the general outline of his career is known to us. It is certain, however, that while he lived he was very influential among the Syrian Christians of Edessa, and that his memory was revered by all, Orthodox, Monophysites, and Nestorians. They call him the "sun of the Syrians," the "column of the Church", the "harp of the Holy Spirit". More extraordinary still is the homage paid by the Greeks who rarely mention Syrian writers. Among the works of St. Gregory of Nyssa (P.G., XLVI, 819) is a sermon (though not acknowledged by some) which is a real panegyric of St. Ephraem. Twenty years after the latter's death St. Jerome mentions him as follows in his catalogue of illustrious Christians: "Ephraem, deacon of the Church of Edessa, wrote many works [opuscula] in Syriac, and became so famous that his writings are publicly read in some churches after the Sacred Scriptures. I have read in Greek a volume of his on the Holy Spirit; though it was only a translation, I recognized therein the sublime genius of the man" (De viris illustr., c. cxv). Theodoret of Cyrus also praised his poetic genius and theological knowledge (Hist. Eccl., IV, xxvi). Sozomen pretends that Ephraem wrote 3,000,000 verses, and gives the names of some of his disciples, some of whom remained orthodox, while others fell into heresy (Hist. Eccl., III, xvi). From the Syrian and Byzantine Churches the fame of Ephraem spread among all Christians. The Roman Martyrology mentions him on 1 February. In their menologies and synaxaria Greeks and Russians, Jacobites, Chaldeans, Copts, and Armenians honour the holy deacon of Edessa.